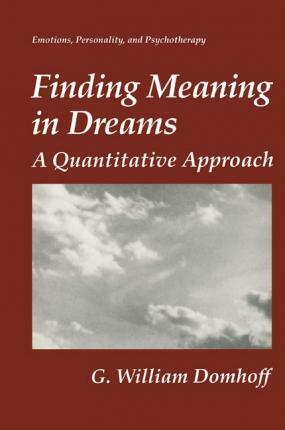 Distinguished psychologist G. William Domhoff brings together-for the first time-all the necessary tools needed to perform quantitative studies of dream content using the rigorous system developed by Calvin S. Hall and Robert van de Castle. The book contains a comprehensive review of the literature, detailed coding rules, normative findings, and statistical tables. Illustrations note XV, 356 p.
The Scientific Study of Dream Content. The Hall/Van de Castle System of Content Analysis. The Quality of the Data. Normative Findings on American College Students. Age Differences in Dream Reports. Crosscultural Similarities and Differences. Consistency and Change in Long Dream Series. The Continuity between Dreams and Waking Life in Individuals and Groups. The Repetition Dimension in Dreams and Waking Cognition. Appendix A: The Hall/Van de Castle Coding Rules. Appendix B: The Coding of a Sample Dream Series. Appendix C: Instructions for Reporting Dreams in Written Form. Appendix D: Statistical Appendix. Appendix E: Normative Tables. Index.